Wonderla Bangalore Contact Numbers, Email Ids are provided for the people who are planning to visit Wonderla Amusement Park.Wonderla Amusement Park offers both dry and water-based rides for all age groups. You can contact Wonderla Bangalore for any queries regarding the packages offered by the amusement park. For People who like to have a nice time at India’s Largest and Safest Amusement Park, just dial the Wonderla Bangalore Contact Number mentioned below to experience high thrill rides, water slides, wave pools, musical fountains, laser shows, virtual reality theatre, restaurants. To Know more information about Wonderla Bangalore , Wonderla Tickets , Wonderla Bangalore Ticket Price, Wonderla Bangalore Timings visit Wonderla Website. Transport Facilities : BMTC offers bus service from various points in Bangalore including Majestic (route 226 and 226J) and KR Market (Route 226C and 226L) to Wonderla Amusement Park. M/s Yes Bee Marketing Inc.
Wonderla Bangalore Ticket Charges : The visitors can book the tickets in advance before 9am of the day of visiting or can book 30 days prior. The ticket fares for different age groups are listed below and note that these prices may be subjected to change. Wonderla Social Network : Follow Wonderla Amusement park on social media sites provided below to know more about the company profile and get latest updates. which day the wonderla of bangalore,mysore road remains closed? what is the ticket rate? iam from tirupathi.i need a help.we r group of students we planned to go to wonderla. can u tell me what cost did we want to pay there. plsss plsss send me d address at dis email id cute.sohi @yahoo.com……. Hi, suggest the buses to wonder la from city bus stand & city market. Also mention which stop to get down to wonder la. 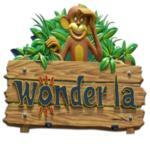 i’m looking for gift vouchers of wounder la, where ill get it, please let me know.